Former Vice President Joe Biden told Democrats to stop moping, lift their heads up and “remember who the hell we are” over the next two weeks in Nevada. Biden, at a morning rally the first day of early voting in Nevada, told Democrats that the American idea was being “shredded” but that he is more optimistic than he has ever been about the country’s potential. His remarks aimed directly at questions about whether Democrats will be enthusiastic enough to turn out in a midterm year to help their party take control of the House and the Senate, as well as win several close races in Nevada. In order to do that in Nevada, Democrats will need to again rely on the power of the so-called Reid machine — named for former Senate Democratic Leader Harry Reid — to turn their voters out to the polls. 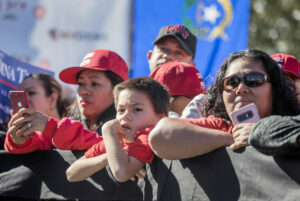 A critical piece of that machine is the footsoldiers at the Culinary Union, the most politically powerful union in the Nevada representing 57,000 housekeepers, bartenders and cooks, and one that is largely female and heavily immigrant. U.S. Sen. Catherine Cortez Masto nodded to their organizing prowess for helping her and Hillary Clinton defy trends and score Democratic wins in in Nevada in the 2016 election. The early vote rally, which featured almost the entire slate of the state’s Democratic candidates, comedian Billy Eichner and a student mariachi, was hosted at the Culinary Union’s headquarters in Las Vegas. The union’s secretary-treasurer Geoconda Arguello-Kline said that more than 200 union workers are organizing, knocking on doors and making phone calls to urge voters to turn out to the polls. Biden promised the crowd that if Democrats take control of the House and the Senate the country would start to see Republicans in each chamber break with their party and “vote the right way.” He said that there is no way that a government can function without consensus and that without it, all power flows to the presidency. “This is the most consequential election of our time, and we must win. Let’s go!” Araujo said. The rally drew a wide range of attendees, including Mexico City Zola Sanchez, 54. She had been a registered Republican since she became an American citizen, largely because of her views against abortion, but switched her affiliation this spring. She said has many friends, Latino and otherwise, who don’t think it’s important to vote. 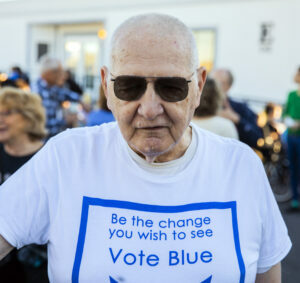 Laughlin resident Dennis Kunecke, 80, drove into Las Vegas for the weekend with his partner to attend both Saturday’s Biden event as well as the rally that President Barack Obama will host on Monday at UNLV. He said that he’s backing Rosen, his current congressional representative, because he believes that she has been a strong supporter of veterans and will move health-care policy in the right direction. “Everyone is concerned she’s making the move too quick, but we’ve got to get rid of Heller and she’s our best bet,” said Kunecke, who already mailed in his absentee ballot. 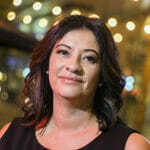 Las Vegas mass shooting survivor Christine Caria, 50, said that Sisolak was “very compassionate” when she met with him and said that she’s hopeful that Attorney General candidate Aaron Ford will be a champion for victims, who she said have largely been abandoned to pay for health-care expenses on their own or directed to the welfare system for help. She noted that the survivors of the shooting span a wide range of political viewpoints but that regardless, they need help. “No one asked each other who we were voting for when we were getting out,” Caria said. One of the keys for Democrats will be mobilizing Latino voters to turn out in a midterm election when enthusiasm tends to ebb. Oscar Trujillo, 22, said he thinks the reality of the policies that the Trump administration has implemented since 2016 will motivate Latinos to participate at greater levels than Republicans or Democrats expect.